The Texas Builders was referred to us by one of our many satisfied clients, and contacted us about building a new website for their home building, remodeling and construction company. 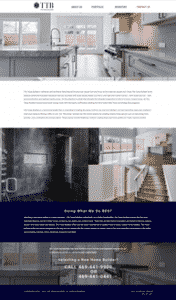 The client wanted a website that looked modern and professional to showcase what their company has to offer and examples of homes they built. We started by having our design team create a design concept of their vision for what the website could look like. We made several design changes and tweaks to the design and once our client was completely happy we began building the website. We built the site in the WordPress Content Management System so that our client would be able to easily manage the website and make additions or changes to it as his company grew and evolved. We also incorporated Responsive Web Design to insure that the website displays correctly on any device and in any browser, then optimized the website to load quickly and rank well in the Search Engines. The image below is a GTmetrix screen capture showing performance scores and page load speed. The Texas Builders now have a website they can be proud of and that showcases the quality of their workmanship.